Located in Taipei City, the National Palace Museum displays the world's greatest and rarest collection of traditional Chinese art crafts and historical documents. These priceless treasures include ancient Chinese paintings, archeological remains of bronze weapons, ceramics, jade, sculptures, books and other antiques. With more than 700,000 items on display, many of which once belong in Beijing's Forbidden City. The National Palace Museum truly reflects the rich cultural heritage of Chinese civilization and ancient Chinese culture. 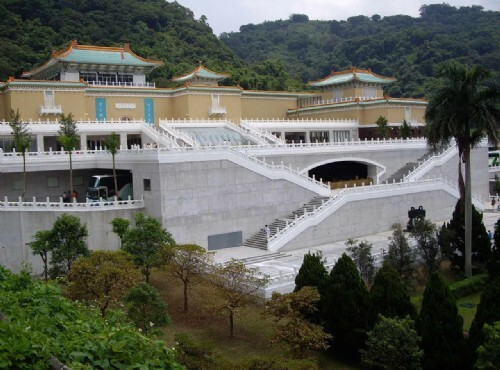 The National Palace Museum was established in 1925 and was expanded and remodeled in 1965. The museum now has a magnificent exterior with tile roofs and moon gates. The National Palace Museum is currently a major guardian of the Chinese artifacts and Chinese cultural items in Taiwan tour. The National Palace Museum provides guided tours in 7 different languages, namely English, Chinese, French, German, Spanish, and Korean. Various researches, speeches, and tours are being held regularly at the museum. It has also published 130 types of magazines, periodicals, pictures, etc. to facilitate and enhance the propagation of Chinese tradition and culture. The National Palace Museum is an extremely popular tour site for foreigners who visit Taipei. Be sure to visit the National Palace Museum during your Taiwan travel! It is a place you wouldn’t want to miss! Guided Tours: Chinese, English, and French guides are provided without any charges. Chinese tour: 9.30 am, 2.30 pm English tour: 10 am, 3 pm French tour: twice a week. Please contact the Information Counter at 886-2-881-2021 extension 292. Visit vouchers: NT$160 Group visits: NT$120 per person (minimum 10 people with identification) Army, police, student special fare: NT$80 (with identification) Retired veterans and civil servants, elderly, handicapped, children under school age: free admission with proper identification. National Palace Museum Opening hours: All year, from 9 am to 5 pm. TEL: 886-2-881-2021 Address: No.221, Sec.2, Jhihshan Rd., Shihlin District, Taipei City, Taiwan *Note: Tour information provided above may need to be updated.